Coordinates: 27°04′N 88°28′E﻿ / ﻿27.06, 88.47 Kalimpong (Nepali: कालिम्पोङ), a hill station (a hill town) nestled in the Shiwalik Hills (or Lower Himalaya) in the Indian state of West Bengal, located at 27.06° N 88.47° E at an average elevation of 1,247 m (4,100 feet). The town serves as the headquarters of the Kalimpong subdivision, a part of the district of Darjeeling. The Indian Army has a major forward base located on the outskirts of the town. Kalimpong, well known for its many educational institutions, attracts students from all over North East India, West Bengal, Bhutan, Nepal, and Bangladesh. Dr. Graham's Homes (co-ed, existing for more than 100 years, 500 acres of land), St. Augustine School (only for boys), St. Joseph Convent (for girls only), Rockvale Academy (co-ed) number among the famous education institutes in Kamlipong. Recently, Kalimpong has become a popular tourist destination owing to its temperate climate and proximity to popular tourist locations in the region. Kalimpong has become famous for its flower market, especially the wide array of orchids. Kalimpong houses several Buddhist monasteries which hold a number of rare Tibetan Buddhist scriptures. Kalimpong town as viewed from a distant hill. In the background are the Himalayan Mountains. The precise etymology of the name Kalimpong remains unclear. "Assembly (or Stockade) of the King's Ministers" in Tibetan, derived from kalon ("King's ministers") and pong ("stockade") represent the most widely accepted origin of the name Kalimpong. Another possible origin to the name comes from the translation "ridges where we play" from Lepcha, derived from the region's traditional tribal gathering for summer sporting events. People from the hills also call the area Kalibong ("the black spurs"). According to K.P. Tamsang, author of The Untold and Unknown Reality about the Lepchas, the term Kalimpong deduces from the name Kalenpung, meaning "Hillock of Assemblage" in Lepcha. In time, the name distorted to Kaleebung and later corrupted to Kalimpong. Another possible derivation points to Kaulim, a fibrous plant found in profusion in the region. The above etymologies point to the original pronunciation as ka-ley-bong which later corrupted to Kalimpong, most probably due to the inability of the British to pronounce the word. Morgan House, is a classic example of colonial architecture in Kalimpong. Until the mid-nineteenth century, the Sikkimese and Bhutanese kingdoms ruled the area around Kalimpong intermittently. Present-day Kalimpong may once have been the forward position of the Bhutanese in the eighteenth century, overlooking the Teesta Valley. The indigenous Lepcha community and migrant Bhutia and Limbu tribes sparsely populated the area. After the Anglo-Bhutan War in 1864, the Treaty of Sinchula (1865) cede the British East India Company Bhutanese held territory east of the Teesta River. At that time, Kalimpong existed as a hamlet, with only two or three families known to reside there. A fleeting reference made that year by Ashley Eden, a government official with the Bengal Civil Service, constitutes the first recorded mention of the town. 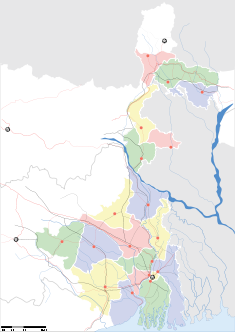 After the war, the region became a subdivision of the Western Duars district, and the following year merged with the district of Darjeeling. The temperate climate prompted the British to develop the town as an alternative hill station to Darjeeling, to escape the scorching summer heat in the plains. Kalimpong's proximity to the Nathula and Jelepla passes, offshoots of the ancient Silk Road, proved an added advantage and it soon became an important trading outpost in the trade of furs, wools and food grains between India and Tibet. The increase in population attracted large numbers of migrants from Nepal, leading to a sudden population increase and economic prosperity. The arrival of Scottish missionaries saw the construction of schools and welfare centres for the British. Rev. W. Macfarlane in the early 1870s established the first schools in the area. The Scottish University Mission Institution opened in 1886, followed by the Kalimpong Girls High School. In 1900, Reverend J.A. Graham founded the Dr. Graham's Homes for destitute Anglo-Indian students. By 1907, most schools in Kalimpong also started offering education to Indian students. By 1911, the population had swelled to 7,880. Following India's independence in 1947, Kalimpong became part of the state of West Bengal, after India and Pakistan partitioned Bengal. With China's annexation of Tibet in 1959, many Buddhist monks fled Tibet and established monasteries in Kalimpong. Those monks also brought many rare Buddhist scriptures with them. In 1962, the permanent closure of the Jelepla Pass after the Sino-Indian War led to a slowdown in Kalimpong's economy, which relied heavily in trade between Tibet and India. In 1976, the visiting Dalai Lama consecrated the Zang Dhok Palri Phodang monastery, which houses many of the scriptures. Most large houses in Kalimpong were built during the British era. In the background is Mount Kanchenjunga. Between 1986 and 1988, the demand for a separate state of Gorkhaland and Kamtapur based on ethnic lines grew strong. Riots between the Gorkha National Liberation Front (GNLF), led by C K Pradhan, and the West Bengal government reached a standoff after a 40-day strike. The town virtually came under a siege, leading the state government to call in the Indian army to maintain law and order. That led to the formation of the Darjeeling Gorkha Hill Council, a body given semi-autonomous powers to govern the district. Though Kalimpong exists peacefully now, the issue of a separate state still lingers. In July 2004, the generally tranquil town catapulted into national and international headlines after police traced Maninder Pal Singh Kohli, a murderer wanted by Scotland Yard, to Kalimpong. A view from the Deolo Resort, atop Deolo Hill, Kalimpong's highest point. The town centre sits on a ridge connecting two hills, Deolo Hill and Durpin Hill, at an elevation of 1,247 m (4,091 feet). Deolo, the highest point in Kalimpong, has an altitude of 1,704 m (5,590 feet) and Durpin Hill's summit stands at an elevation of 1,372 m (4,501 feet). The River Teesta flows in the valley below and separates Kalimpong from the state of Sikkim. The Shiwalik Hills, like most of the Himalayan foothills, have steep slopes and soft, loose topsoil, leading to frequent landslides in the monsoon season. The hills nestle within higher peaks and the snow-clad Himalayan ranges tower over the town in the distance. Mount Kanchenjunga at 8,591 m (28,185 feet) the world's third tallest peak, stands clearly visible from Kalimpong. View of the Himalaya range. Kalimpong has five distinct seasons: spring, summer, autumn, winter, and the monsoons. With mild summers, the highs usually never crossing 30 °C (86 °F), and last between May and June. Summers bring the monsoon rains which lash the town between June and September. Severe, the monsoons often cause landslides which sequester the town from the rest of India. Winter lasts from December to February, with the maximum temperature being around 15 °C (59 °F). During the monsoon and winter seasons, fog often envelopes Kalimpongby. The annual temperature ranges from a high of 30 °C to a low of −4 °C (25 °F). Many locales in Kalimpong receive their name based on its distance in miles from Teesta Bazaar, a town on the Teesta River in the valley below. For example, the locale 13th mile would be situated at a distance of 13 miles (21 km) from Teesta Bazaar. Oranges grown in the hillsides are exported to many parts of India. Tourism has become the most significant contributor to the Kalimpong economy, the summer and spring seasons proving the most popular with tourists. Many of Kalimpong's residents keep employed directly and indirectly from tourism. 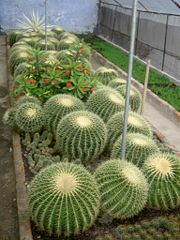 Farming on terraced slopes provides a major source of livelihood for the rural populace while supplying the town with fruits and vegetables. Education has been replaced as the primary driver of the economy of the town but in recent years its contributions to the economy have stagnated, tourism bringing more money. Many establishments cater to the Indian army base near the town, providing it with essential supplies. Small contributions to the economy come by the way of the sale of traditional arts and crafts of Sikkim and Tibet. Government efforts related to sericulture, seismology, and fisheries provide a steady source of employment to many of its residents. Kalimpong has earned a reputation for its flower export industry – especially for its wide array of indigenous orchids and gladioli. The Indian government's proposal to reopen the Nathula and Jelepla passes in April 2006 will significantly boost the economy, as Kalimpong lies on historic trade routes. The economic mainstay of Kalimpong has been its many schools. Those schools, besides imparting education to the locals, also cater to a significant number of students from the plains, the neighboring state of Sikkim and also foreign countries such as Bhutan, Bangladesh, Nepal, and Thailand. Besides providing livelihood to those directly involved with education, such as teachers, paying guest-keepers and other school staff, they also provide a good source of income to book sellers, hawkers, canteen wallahs, restaurant owners, garment sellers and drivers. During the winters, when schools shut for vacations, the economy of the town goes into a low scale hibernation mode. National Highway 31A winds along the banks of the river Teesta near Kalimpong. Most people live fairly close to the market and so they walk between their homes and the market. Those staying far from the town centre own vehicles or rely on local share-taxis to travel to their destinations. Taxis companies provide service exclusively in the city. Four wheel drives, able to easily navigate the steep slopes in the region, have become the most popular means of transport. Bagdogra Airport near Siliguri, located at a distance of 80 km (50 miles), provides the city with air service while New Jalpaiguri, located on the outskirts of Siliguri, offers the nearest railhead connecting the rest of India. Kalimpong sits near the National Highway 31-A, which links Siliguri to Gangtok. As of 2001 India census, Kalimpong had a population of 42,980. Males constitute 52 percent of the population and females 48 percent. Kalimpong has an average literacy rate of 79 percent, higher than the national average of 59.5 percent: male literacy is 84 percent, and female literacy is 73 percent. In Kalimpong, 8 percent of the population are under six-years-of-age. Kalimpong serves as the headquarters of the Kalimpong division, a part of the Darjeeling district. The Darjeeling Gorkha Hill Council (DGHC), a semi-autonomous body set up by the West Bengal government governs the district. Kalimpong elects eight councillors to the DGHC. The town divides into twenty-three municipal wards by the local municipality, while 47 gram panchayats compose the rural area. There are three blocks in Kalimpong. Kalimpong's municipality administers the infrastructure of the town such as potable water and roads. Two lakes atop Deolo Hill provide potable water to the town. Owing to severe rains that wash away most of the surface, the condition of the roads is poor. The state electricity board provides electricity to Kalimpong and, although the town has plenty of power, the electrical supply has been unstable, requiring voltage stabilisers. Only in the main town centre enjoys street lighting. The Public Works Department maintains the road connecting the town to the National Highway–NH-31A. A district magistrate presides over the Kalimpong division. Kalimpong has a small police department with a lock-up. Police transport most criminals to the Darjeeling, the district headquarters for trial. The Zang Dhok Palri Phodong monastery atop Durpin Hill. Ethnic Nepali comprise the majority of the populace, having migrated to Kalimpong in search of jobs during the era of British rule. The Buddhist communities of the then Gorkha kingdom of Nepal, like the Tamangs, had close contacts with the Buddhist communities of Darjeeling Hills. Many families, mostly that of monks, settled in the Darjeeling area with the permission of the Lepcha and Bhutanese rulers and chiefs. The oppressed ethnic communities of Nepal belonging to the Kami, Damai and Sarki people also migrated in large numbers to the region during the time of the reign of the Gurkha kings in Nepal to escape the tyranny of the Gurkha kings. Indigenous ethnic groups include the Newars, Lepchas, Bhutia, Sherpas, Rais, Tamangs, Yalmoos, Bhujels, Sunuwars, Gurungs, Damais, Kamais and the Limbus. The other non-native communities include the Bengalis, Marwaris, Anglo-Indian, Chinese, Biharis, and Tibetans who escaped to Kalimpong after fleeing the Communist Chinese invasion of Tibet. Kalimpong, the closest Indian town to Bhutan's western border, has a small number of Bhutanese nationals residing here. Hinduism constitutes the largest religion followed by Buddhism and Christianity. Islam has a minuscule presence in this region, with a mosque in the bazaar area. Popular festivals include Diwali, Christmas, Dussera or dasain in the local nepali dialect and the Buddhist festival of Losar. Languages spoken in Kalimpong include Nepali, the predominant language, Lepcha, Limbu, Tamang, Kirat, Hindi, English and Bengali. Soccer, Cricket and Archery number among the most popular sports in Kalimpong. The most popular snack in Kalimpong is the momo, steamed dumplings made up of pork, beef or vegetable cooked in a wrapping of flour and served with watery soup. Wai-Wai is a packaged snack comprising of noodles, eaten either dry or in soup form. Churpee, a kind of hard cheese made from cow's or yak's milk is sometimes chewed. A form of noodle called Thukpa, served in soup form is also popular in Kalimpong. A large number of restaurants offer a wide variety of cuisines, ranging from Indian to continental, to cater to the tourists. Tea is the most popular beverage in Kalimpong, procured from the famed Darjeeling tea gardens. The cultural centres in Kalimpong include, the Lepcha Museum and the Zang Dhok Palri Phodong monastery. The Lepcha Museum, situated a kilometre away from the town centre showcases the culture of the Lepcha community, the indigenous peoples of Sikkim. The Zang Dhok Palri Phodong monastery has 108 volumes of the Kangyur, and belongs to the Yellow Hat sect of Buddhism. Internet cafés flourish in the main market area, mostly served through dialup lines. BSNL provides a limited form of broadband connectivity of up to 128 kbit/s with DIAS (Direct Internet Access Service) connections. Only one radio station, the public station, All India Radio serves Kalimpong. The area has good cell phone coverage supported by companies such as BSNL, Reliance Infocomm, Hutch and Airtel. Fifteen major schools operate in Kalimpong, Dr. Graham's Homes, St. Augustine's School, Rockvale Academy, St Joseph's Convent, and Springdale Academy the most notable among them. The Scottish Universities Mission Institution opened the first school in 1886. Schools offer education up to class 10, following which students may choose to join a Junior College or carry on with an additional two years of schooling. The Kalimpong College and the Cluny Women's College represent the main colleges in the town, both affiliated to the North Bengal University. Most students choose to further their studies in Siliguri and Calcutta. The Tharpa Choling Monastery, near Kalimpong is an educational institute that imparts religious training to young Buddhist monks. The area around Kalimpong lies in the Eastern Himalayas, classified as an ecological hotspot, one of only three among the Ecoregions of India. Acacia, represents the most commonly found specie at lower altitudes, while Cinnamon, ficus, bamboo, cacti, and Cardamom, grow on the hillsides around Kalimpong. Pine trees and other evergreen alpine vegetation inhabit the forests found at higher altitudes. Seven species of rhododendrons grow in the region east of Kalimpong. The temperate deciduous forests include oak, birch, maple, and alder. Three hundred species of orchid bloom around Kalimpong, and Poinsettia and sunflower number among the wild species that line the roads of Kalimpong. The Red Panda, Himalayan Black Bear, Clouded Leopard, Siberian Weasel, Asiatic black bear, barking deer, Himalayan Tahr, goral, gaur, and pangolin roam the fauna near Kalimpong. Avifauna of the region include the Himalayan Griffon Vulture, Monal pheasant, hornbills, Black Baza, Besra, Eurasian Sparrowhawks, and the Kalij Pheasant. Kalimpong also has over 46 nurseries which cultivate gladioli, accounting for 80 percent of India's production and orchids. The nurseries export flowers to many parts of the world. Two ecological museums, the Nature Interpretation Centre and the Rishi Bankim Chandra Park, operate within Kalimpong. Kiran Desai's Man Booker Prize winning novel, The Inheritance of Loss uses Kalimpong as its locale. The novel, set in the 1980s, tells the story of a retired judge's family and their neighbors, with the Nepalalese insurgent movement led by the GNLF featured prominently. The inhabitants of Kalimpong reportedly expressed anger over negative stereotypes of Indian Nepalese people in the novel. ↑ 1.0 1.1 1.2 1.3 Kalimpong. sikkiminfo.net. Sikkim Computers & Systems(P.) Ltd.. Retrieved May 6, 2008. ↑ 2.0 2.1 History of kalimpong. Darjeelingnews.net. Darjeeling News Service. Retrieved May 6, 2008..
↑ 3.0 3.1 Banerjee, Partha S (May 19, 2002). A quiet hill retreat, far from the tourist crowd. Spectrum, The Tribune. The Tribune Trust. Retrieved May 6, 2008..
↑ Wife duped by murder fugitive, Sun Times. Retrieved May 6, 2008. ↑ Peter Foster, Sunday Times (South Africa), Sun Times. Retrieved May 6, 2008. ↑ Routes of promise, Frontline. Retrieved May 6, 2008. ↑ Frontline magazine, Volume 20, Issue 14; July 5–July 18, 2004. Frontline. Retrieved May 6, 2008. ↑ Kalimpong, NITPU. Retrieved May 6, 2008. ↑ NITPU Kolkata, West Bengal, NITPU. Retrieved May 6, 2008. Daily Kalimpong News and Information. This page was last modified on 10 April 2018, at 19:03.